Oh, sweet summer, where did you go? I long for the lazy afternoons lounging by the pool, soaking in the golden sun rays, the mornings when I would wake up with no plans- those days are gone now as the school year has officially begun. Say goodbye to popsicles and impromptu weeknight barbecues and hello to piles of homework, furious studying, and curfews. 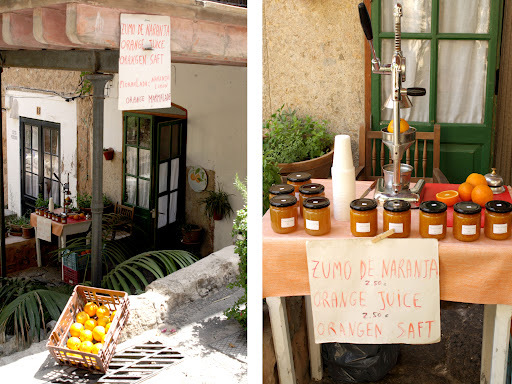 One of the most memorable weeks of my vacation was spent on the beautiful Spanish island of Majorca, where my family and I hiked miles to secluded island coves, ate simple meals of fresh seafood, and disovered a quaint citrus stand selling marmalade of oranges plucked from the nearby groves. We happened upon this stand while strolling through the tiny, mountain village of Deía and knew that we had to purchase a jar to take home with us as a souvenir. I certainly wasn’t going to miss out on the opportunity to capture this fun foodie moment. In classic blogger fashion, I whipped out my Canon and began snapping away photos. I first sampled the marmalade with a dab of butter spread on a crusty French baguette. The citrusy flavor was so pronounced and vibrant, unlike the overly-sweet jarred stuff we’re used to in The States. 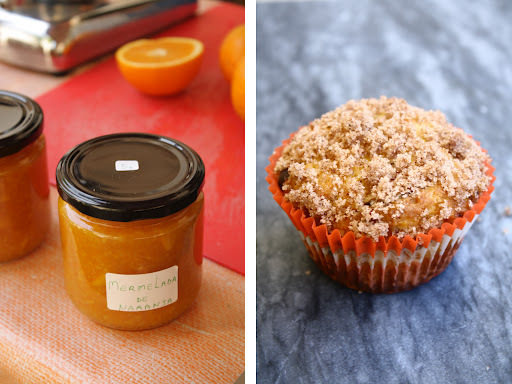 I immediately began dreaming up ways to incorporate the marmalade into a baked good and after much deliberation, I ended up with these awesome Orange Marmalade and Chocolate Crumble Muffins. The orange flavor really shines in this recipe without being overbearing, contrasting well with the slightly bitter dark chocolate chunks. 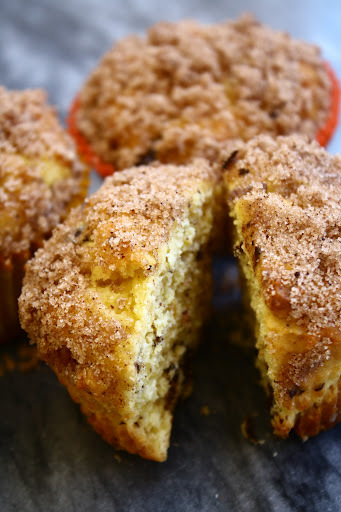 The interior of the muffin is tender and subtly moist and crowned with a generous crumble topping. Since marmalade is the key ingredient in this recipe, make sure you invest in a quality brand- maybe from your local farmers’ market. 1. Preheat the oven to 375 degrees. Sift together the flour, sugar, and baking powder in a large mixing bowl. Use a pastry cutter or fork to incorporate the butter into the dry ingredients. Mix the marmalade, orange juice, beaten eggs, and vanilla extract in a small bowl and add the mixture to the dry ingredients. Gently mix all the ingredients together, using fewer than 10 large strokes with a wooden spoon. Do not overmix; the batter should be just barely combined. Before the last few stirs, fold in the chocolate chunks. In a small bowl, mix all the topping ingredients together (the mixture should be clumpy). 2. Fill the lined muffin tins almost to the top with batter. Sprinkle one heaping teaspoon of topping over each muffin. 3. Bake the muffins for 20-22 minutes. Remove the muffins from the pan and allow them to cool on a wire rack. While I love summer’s bounty of stone fruits and berries, all of which make lovely pies and cobblers, I crave chocolate all year round. A reliable chocolate dessert is an item that should be on your repertoire no matter the season. Enter chocolate soufflé cake: a pillowy, simply chocolate delight that can be whipped up with just five ingredients. The texture of this dessert really sets it apart from the overly-dense and sticky flourless chocolate cakes I have tried. 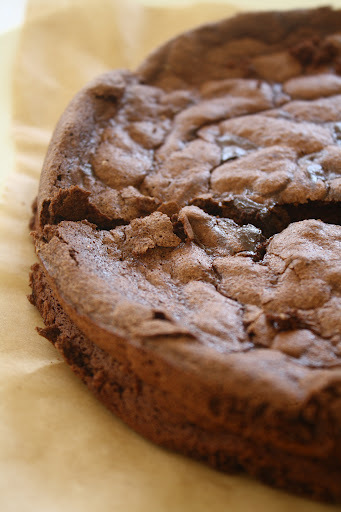 This one is soft and perfectly moist, the pieces crumbling as you remove a slice and almost melting on your tongue. The secret to this cake is in the technique: the whipped egg whites provide a beautiful lift and airiness. You know your egg whites are stiff when they hold their shape on the beater or they don’t fall when you invert the bowl. Do not fall victim to perfectionism when folding the batter together in the final step; work smoothly and efficiently just until the egg whites and chocolate are combined. 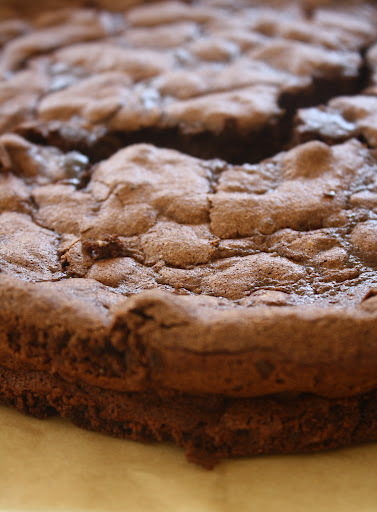 Since there are so few components to this recipe, good-quality chocolate is essential. I recommend Scharffen Berger or Cordillera, both of which can be found at Whole Foods. Chocolate is a wonderful canvas for other flavors; you can dress this cake up according to your personal preferences. Serve it with a dollop of lightly whipped cream and fresh berries, a scoop of vanilla bean or coffee ice cream, or simply a tall glass of cold milk. 1. Preheat the oven to 350 degrees F. Line the bottom of a 8-inch round cake pan with parchment paper and grease the sides with butter. 2. Place the 1/4 cup water and chocolate in a medium bowl and melt the chocolate over a double boiler; set aside. In the bowl of a stand mixer fitted with a whisk attachment, beat the egg whites on high speed until they reach the soft peak stage. Slowly stream in 1/4 cup sugar and continue beating until stiff peaks form; set aside. 3. In the bowl of a stand mixer fitted with a whisk attachment, beat the egg yolks, salt, and the remaining 1/4 cup sugar on high speed until the batter forms a ribbon (about 5 minutes). Add the melted chocolate to this yolk mixture and beat on medium speed for an additional minute just to incorporate the two. Fold the egg whites into this mixture in thirds, making sure not to overfold. Pour the batter into the prepared cake pan and bake for 25 minutes. The center of the cake should be moist but not raw. 1. In a large saucepan over medium-high heat, combine the cherries, sugar, water, and lemon juice. Cook, stirring occasionally, until the cherries have softened and released their juices, about 10 minutes. Remove from the heat and stir in the almond extract. Let the mixture cool completely. 2. Transfer the cherries and their syrup to a shallow container, cover, and freeze until firm, at least two hours. Once the cherry mixture has frozen completely, remove it from the freezer, break it up, and process it in a food processor fitted with a metal blade until completely smooth. Serve right away. For someone who doesn’t own an ice cream maker, frozen desserts are a category I rarely venture into. 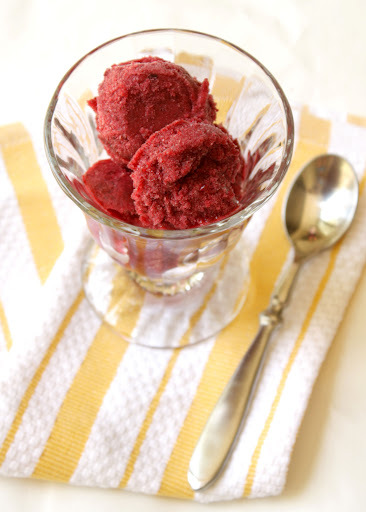 So when I discovered this recipe for cherry sorbet only requiring a freezer, I knew I must make it right away. I mixed up the ingredients in a matter of minutes, popped the mixture into the freezer for a few hours, and puréed it until smooth. Voilà! This dessert is simple, delicious, and can be endlessly adapted. You could use yellow peaches instead of sweet cherries and replace the almond extract with vanilla; pineapples and coconut extract would make for a lovely tropical combination. You could purée the fruit syrup before freezing, pour it into popsicle molds with a couple fresh cherry halves, and make homemade fruit pops. For a granita: freeze the sorbet as directed, crush it up with some shaved ice, add a splash of pure cherry juice, and top with a few sprigs of mint. Or grind two parts ice with one part sorbet for a refreshing slushy. No matter how you choose to prepare this quintessential summer dessert, I can guarantee that it will be a success. A wide array of chocolates fill the display case at Swiss chocolatier, Teuscher. 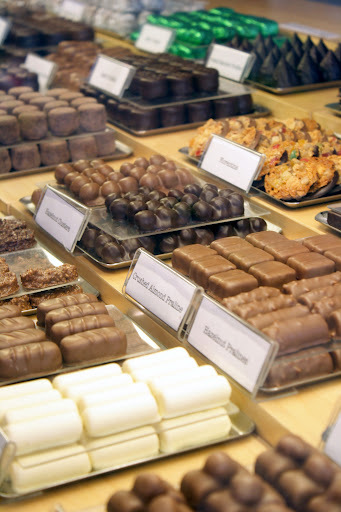 Last weekend, my sister Lena and I embarked upon a three-hour gourmet chocolate walk around the beautiful city of San Francisco, where we sampled chocolates from some of the world’s finest chocolate purveyors. Our journey began at The Ferry Building, where we learned proper chocolate tasting technique and tested our skills at our first stop: Scharffen Berger. Of the bars we sampled, my personal favorite was the dark chocolate with sea salt. We then moved on to La Cocina, a business incubator that provides young entrepreneurs with commercial kitchen space and technical advice. The kiosk we visited sells products engineered by many of the students in the program, including a wide array of hand-crafted chocolate confections. My favorite item from La Cocina is the cinnamon truffle: a silky smooth chocolate ganache interior coated in an additional layer of chocolate and dusted with spicy Vietnamese cinnamon. Our third destination, Recchiuti, offers Parisian-inspired chocolates handmade in San Francisco. As someone who prefers rich, unhindered chocolate flavor over fruity and herbal concoctions, I was completely blown away by the jasmine tea truffle. 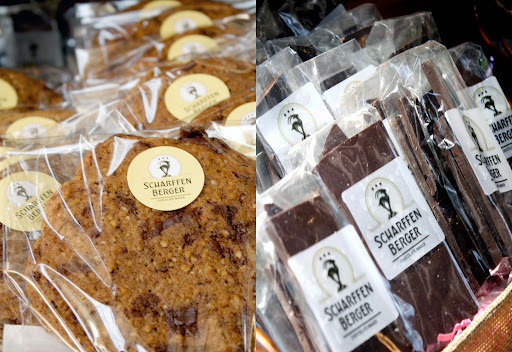 Scharffen Berger’s giant chocolate chunk cookie is to die for. Paper thin and crispy, blotted with pieces of the classic 70% cacao bar. We then walked a few blocks over to Fog City News, San Francisco’s most plentiful newsstand and candy store. Not only does Fog City offer an extensive selection of magazines, newspapers, and periodicals, but it boasts one of the largest chocolate collections in the country. We really saved the best for last, though, as we concluded the tour at Teuscher Chocolates of Switzerland and CocoaBella. Biting into Teuscher’s Champagne Truffle is chocolate heaven: a thin chocolate shell dusted with confectioner’s sugar surrounds a center of creamy chocolate ganache and Dom Perignon champagne cream. CocoaBella is a gourmet chocolate carrier, sourcing its products from the world’s acclaimed chocolate artisans. The store is divided into two sides: North America and Europe. The European chocolates contain traditional flavor pairings and simple presentation whereas the North American offerings are more adventurous, including options such as a cayenne spiced truffle and a bleu cheese truffle. Aside from all the taste-testing, I learned quite a bit about the history of chocolate, chocolate composition, and even the political controversies surrounding chocolate production. It was also a pleasure to chat with the other foodies on the tour and to analyze the different items we sampled. Whether you are a chocolate lover or a curious foodie (or both! ), this gourmet chocolate tour is a real treat.